According to the Collingwood Conservation Study, the Victorian century hotel was demolished and replaced between 1906 and 1909; re-built 1937/38; additions facing Queen's Parade 1957-58; additions facing Heidelberg Road 1966. 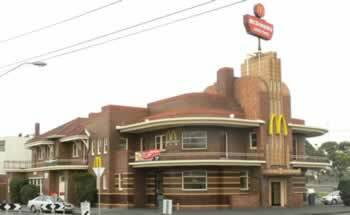 Both the Victorian style and the Moderne style hotel made notable architectural statements in this prominent triangular position at the junction of the roads leading from Clifton Hill to Heidelberg and Northcote. The old hotel was a substantial cement-rendered two storey building with a slate roof and an elaborate verandah and is reputed to have been used as a staging-post where coaches changed horses. This may be the only hotel in Collingwood which retains a horse trough outside; these troughs were once a fixture at most hotels. The current building was designed by James H Wardrop, an architect noted for his role in the development of the European-based Moderne architectural style in Melbourne, and built by Hansen and Yuncken Pty. Ltd.
As Robin Grow says: 'The suburbs of Melbourne also boasted a number of new hotels, none better than the United Kingdom Hotel... the site provided the perfect setting for its ocean liner appearance. With a front section finished in terracotta and sweeping balconies, the two-storey hotel also featured windows with distinctive geometric designs.' ( Melbourne Art Deco, p. 40 ). While supervising the construction of the hotel, Wardrop was asked to design a new garage on an adjacent site and asked to carry on the distinctive architecture of the hotel. ( Melbourne Art Deco, p. 100 ). Because of the status of the building, McDonald's was obliged to be very careful in any work they did in turning the notable building into a restaurant.